Vampire Diaries Wedding Dance. . Wallpaper and background images in the Damon & Elena club tagged: the vampire diaries damon elena delena elena gilbert damon salvatore season 2. 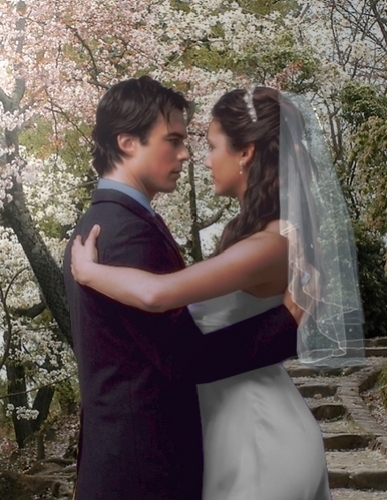 This Damon & Elena fan art contains gadis pengisi pengantin, pembantu rumah kehormatan, bridesmaid, and maid of honor. There might also be sejambak, korsase, karangan bunga, seikat bunga, american express, posy, and nosegay. Omg this s freaking awesome ,.,..!!,,,,.,...,.,..!! OMG!!! That is... Wow! It's amazing! Love it! It looks so real!! They would be the most beautiful bride and groom!! awww..they look so great together..Love this pic.